Dear Friends and Partners, Back in 2010 the Lord spoke to me through an open vision that He would begin to move on island nations in a mighty way. He gave me the scripture, Isaiah 11:11 and told me that God's hand would once again return to those island nations. Being true to His word, he opened a door of ministry to the island of Haiti. We saw a mighty outpouring of the Holy Spirit with miracles, signs and wonders while there. Many were healed of various diseases and cripples walked. Thousands heard the gospel preached! God has put the nations in our hearts and this year we are already planning trips to Brazil and Nepal. As you read this letter, my Father is preaching crusades in Pakistan. So we are very excited to let you know about another amazing opportunity. God has opened a door to yet another island nation. 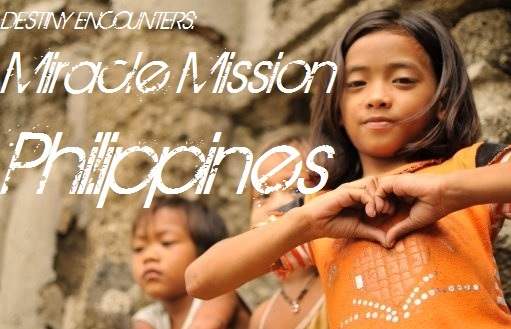 We have the opportunity to minister in the Philippines this May. We will be reaching thousands of people during our time there. This is a Divine connection and appointment for many that will not happen without your help. As our partners we need your prayer support immediately, as well as to raise $1,000.00 in the next two weeks. If you have ever been touched by our ministry, please prayerfully consider giving into this. Lives will be changed and you can be a part of it. Please follow the link below and thank you again for your donations. We will be sending out updates regarding this trip, as well. Many blessings on you and your family during this Resurrection season! !